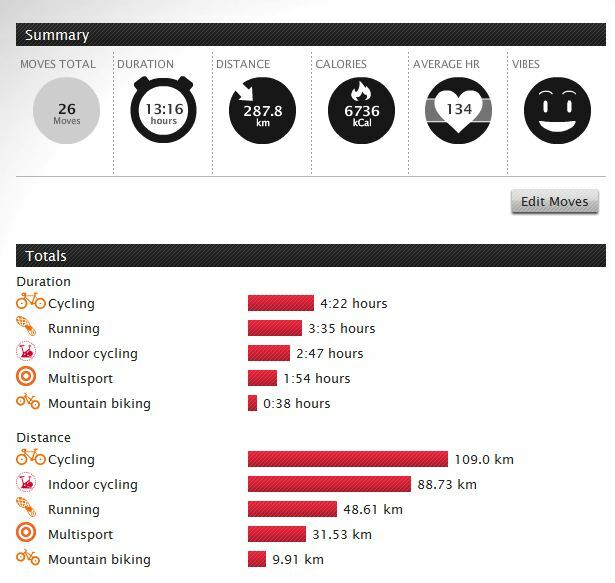 Data trackers extraordinaire Strava has published its annual end of year insights for 2015, and there is some pretty info in the report. Comprising millions of individual uploaded rides, the data offers unique insight into the habits and behavior of cyclists in the United States. For example in 2015, 5.3 activities were uploaded and shared on the social network every second. 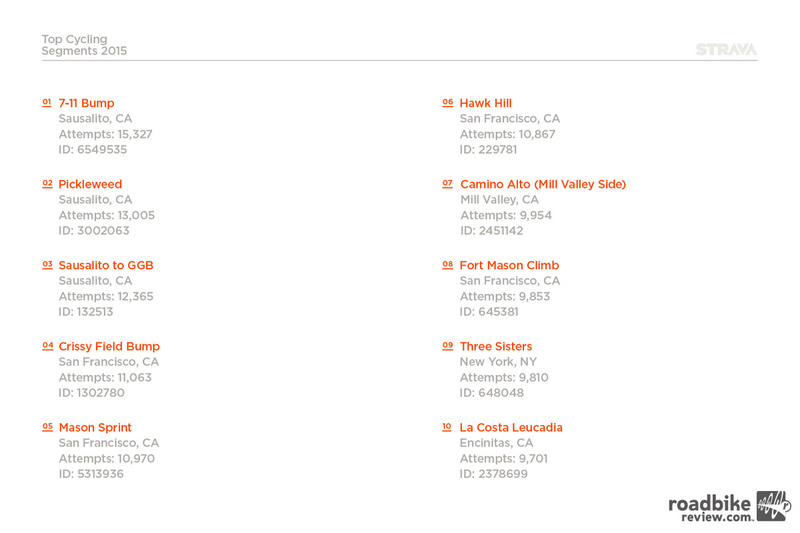 This immense depth of data allows documentation and analysis of Strava’s growth in the world of cycling and running in the United States, while also providing direct comparison with the Strava community on a global scale. Here’s a breakdown of some of the most interesting information. Over 26 million rides uploaded in the U.S.
Across Strava’s global platform, cyclists shared a total of 115.8 million rides in 2015, accruing a total of nearly 2.6 billon miles — almost enough for a one-way trip to Neptune. 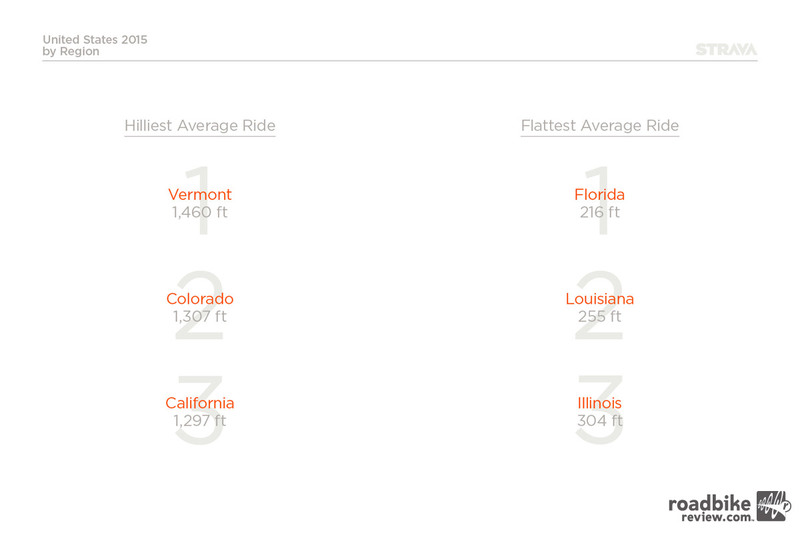 Strava’s cyclists together accumulated 133 billion vertical feet in elevation gain. Cycling uploads on Strava continue to grow and grow as riders in the U.S. logged 26,320,103 individual rides throughout the year, logging 539,112,239 miles along the way. Saturday, July 11 proved to be the year’s most popular day for a ride. From the hills of Vermont to the high Rockies of Colorado, riders in the U.S. climbed an 25.6 billion vertical feet. For average distance, men recorded 23 miles for each ride, while women averaged 20 miles. The average ride time was yet another significant difference, as the men’s 1:54:00 put them in the saddle for longer than the women, who registered 1:38:00 in comparison. Women recorded an average speed of 12.7 mph for an individual ride, with men registering 14.6 mph. Not known as a traditional cycling state, Louisiana emerged as surprisingly the fastest state, with an average speed of 15.2 mph, joined by flatland Florida atop the ranking for longest average ride with 24.2 miles. Also surprisingly, Vermont topped Colorado and California as the biggest climbers, with 1,460 vertical feet gained per ride. For many Strava members, commuting is a large part of their daily routine, with an average of 95,878 rides recorded as commutes to and from work every week. A pacey average of 15.0 mph ensured riders made it in on time, tackling an average 10.5 miles door-to-door. Winter was an unappealing affair for many, axing commuter activity by 63.3 percent as people returned to more comfortable methods of transport. More than 10,000 cyclists have taken part In the Tour de France since it started. it is estimated they have covered more than 350,000km. At 5,745km, the 1926 Tour was the longest. Three Tour riders have died while racing (Francisco Cepeda, Tom Simpson and Fabio Casartelli). The youngest winner was Henri Comet, who won in 1904 at the age of 20. France has won the race 36 times, followed by Belgium with 18 wins. Eddy Merckx has amassed the greatest number of stage wins 36. Will make an effort to do more next month – but despite this setback on the exercise front I am very chuffed that so many people read this disparate and weird blog – below is the WordPress Stats ….. so to all you out there thank you very much. Here is a guide to windy kiteboarding months – it is difficult to accumulate a full list, as this is compiled from many sources, so use this as a guide. Obviously you can get wind at other times than shown here and you also can get skunked! If you have locations you would like to see in the list feel free to let us know. * – means varies depending on the island or side.